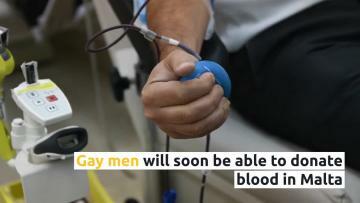 Gay men will be able to donate blood next year, as the health authorities invest in new equipment that screens blood donations to reduce the risk of transfusion-transmitted infections. Health Minister Chris Fearne said the equipment would be in place in around six months. In the meantime, the government was also looking into moving the donation centre, currently situated adjacent to St Luke’s Hospital in Guardamangia, closer to Mater Dei Hospital over the next three-and-a-half years. Gay men are currently prohibited from donating blood to prevent the transmission of HIV, which is disproportionately prevalent among such individuals. However, with the introduction of what is known as nucleic acid testing (NAT) equipment in some six months, men in a relationship with other men would be able to donate blood. 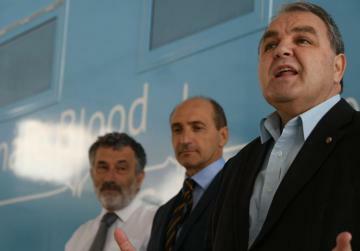 Speaking at the launch of a refurbished mobile blood transfusion unit, Mr Fearne called on people to donate blood, as the need for 50 bags a day remains constant throughout the year. There were 16,000 blood donations last year when 2,000 people registered as new donors. Blood products – including platelets – are essential for operations, accidents and cancer treatment. Mr Fearne said that from experience, while medical staff did their best to save lives, this would not be possible without donors’ help. The health authorities are meanwhile launching a campaign in collaboration with various local councils to encourage more people to donate. Addressing the media on Wednesday, Speaker Anglu Farrugia, himself a regular donor, urged people over 60 to continue donating until they turn 68. “Every donor could help our three people with just one donation. Blood donation is the noblest thing one can do, its value outweighs any financial gift that one could make,” he added. Blood reserves have dwindled at the donation centre, and people are being urged to head to the unit in Guardamangia at their earliest. Blood donation is usually low throughout August, but it has not been so scarce in years, and surgeries could be postponed as a consequence, director of the centre Alex Aquilina said. Donors should take their identity card, driving licence or Maltese passport with them. Those who wish to give blood and have returned from abroad over the past four weeks should call on 8007 4313 to check whether they are eligible. The centre, is open from Monday to Sunday between 8am and 6pm. Donors can also go to the Gozo General Hospital’s outpatient department every other Sunday, from 8am to 1pm and every alternate Tuesday from 1 to 5pm. To keep updated, look up National Blood Transfusion Service – Malta on Facebook.